It’s been a little while since I’ve shown dress-over-pants. Have you noticed that fashion editors have been aggressively promoting this look since pre-Fall 2015? For me, this look is a way to wear short dresses. I was on some website the other day (Shopbop? Neiman Marcus?) that allowed one to sort dresses by length (mini, knee, midi, evening) and noticed that a significant number of the “knee” length dresses only came to mid-thigh and that some of the “midi” length dresses ended at the knee. Hmmmm. While I understand the commercial strategy behind vanity sizing, I am at a loss to understand what purpose is served by misleading statements about dress length. Any delusions you might have about your own height are checked as soon as you stand next to another human being. Do they think that I’ll think that I’m really tall when the knee-length dress stops in the middle of my thigh? This dress is a saturated fuschia; the color is so intense, it’s a little hard to stop looking at it once you’ve started. Not all laces are created equal. Some are prettier than others. I love this lace, which is row upon row of little paisley figures. Or are they packing peanuts? Amoebae? 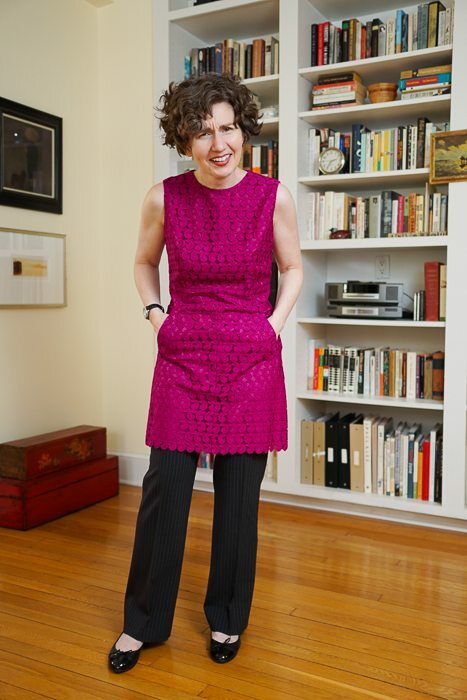 As if the color and amoebae weren’t enough, this dress has clever, svelte pockets. I need a sweater to stay warm. Thanks, Kate! Little did I imagine so much discussion, as you can see below. 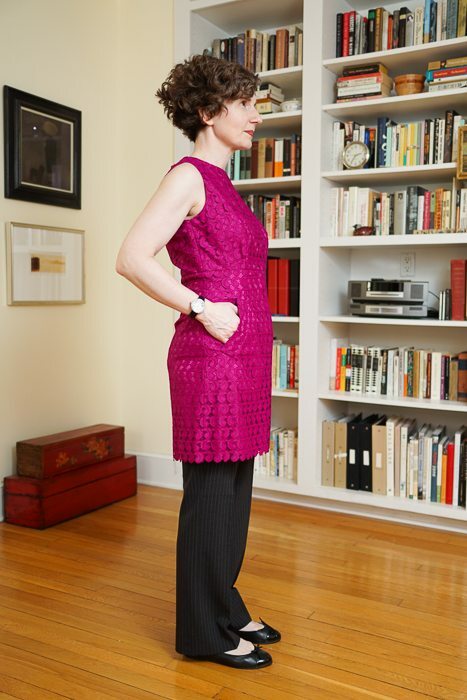 I heart the Directrice and I heart the dress but I do not heart dress over pants, ever. It’s just weird for me. It looks like two pieces of two different outfits put together into one, wrongly. What do the rest of you think? I am going to be stoned in a public square for being so negative about the beloved Directrice’s outfit? Whenever I ask The Photographer how I might encourage more comments, he tells me that I need to post something controversial. Unwittingly, I did so today! But because Directrice readers are very reasonable and well-mannered, you have no fear of death threats — just healthy debate about this weighty topic. Jodie — You’re a quarter step away! I am one for dress over pants. I tend to wear “mini dress with skinny pant” as a preference since my figure favors that kind of proportion. I am tall, have good legs (thus want to show them off), and have a tummy/hip area that is better appreciated with structured coverage. Dress over pants connotes artistic flare – like you thumb your nose at convention and pair clothing pieces together with a joie de vivre! I stone no one though – we all have our own comfort levels. 1. Thanks for having my back on this one, Sharla. Seems like we are in the minority on this one. 2. You are a model of tolerance and forbearance. We can all get along! I wish we could lobby designers and retailers to create and sell gorgeous dresses like this that are truly knee length. Not a fan of dress-over-pants for myself, but I’d love to buy that dress to wear as a dress if it were an appropriate length. One has to wonder why this consumer feedback is not having any impact on manufacturers. Perhaps if they listened to their customers, they would stop competing with places like Zara and H&M and hedging toward bankruptcy . . . 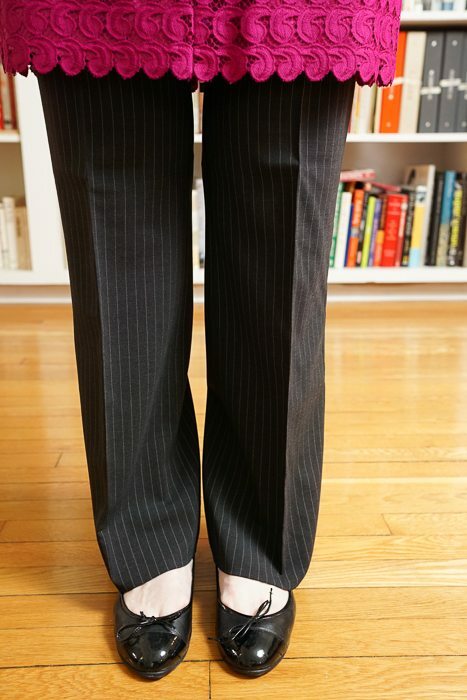 While dress-over-pants would solve my conundrum of being 5’10, 59, and sick of thigh-length “knee-length” dresses (for work! in an office! in a big city! ), I don’t like the look. Black dress over black tights is the closest I’ll go. SO WISH designers would wake up and make truly knee-length dresses again. I do think the midi-trend, which sometimes means knee-length rather than mid-calf, has helped. I feel like there are more knee-length dresses now than there were 5 years ago — but that’s just a feeling, not an empirically-supported thesis. How wonderful to be 5’10”! I like the look of a dress over pants, but am in agreement with some of the commenters that I would not indulge in this fun fashion option, although for a different reason than the others. My primary concern is that, being 5’4″ and a true hourglass size 10, I think the multiple layers would add bulk around the hips, which is never flattering on me. But I digress. The point of my comment is to ask if you could expound on the topic of lace in the office setting. As in-house General Counsel for an agency, I rarely go to court anymore, and most of my days are spent at my desk or in in-house meetings. So I don’t need to adhere to a completely traditional look. 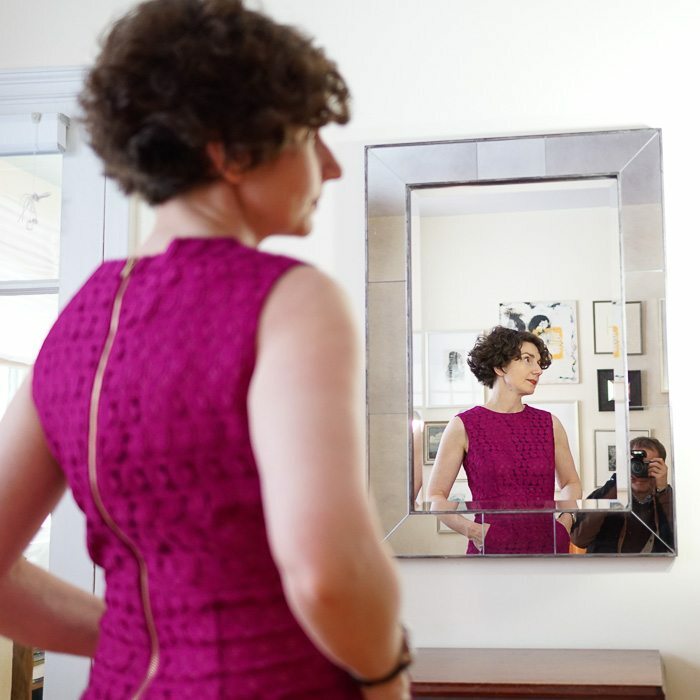 Nevertheless, every time I don a lace shell or camisole, to be worn under a jacket or cardigan, I feel like I’m dressing for an evening out. How much lace is too much lace? What is acceptable in a fairly traditional, non-artistic workplace? You ask an excellent question, Tracy! A lace top seems completely appropriate for daytime to me. I think that an all-lace dress, worn as a dress, might be too dressy for the workday — but I am open to persuasion if others chime in. Perhaps the all-lace dress could be rendered a little less dressy with a jacket or sweater. Perhaps we should consult the teachings of Michelle Obama, who has paved the way for all of us to wear the fun, dressy fabrics and sparkly things during the day. (Have you noticed, though, that she never works the decolletage during the day? She’s a model of modern decorum.) One final thought: eyelet and broderie anglaise dresses are pretty and appropriate for daytime office wear in the summer. I’m realizing that dress-over-pants solves a lot of my fashion problems — tall and narrow but not very enthusiastic about baring skin. Plus it adds a dash of insouciance. I found a 60s-style shift dress in the girls’ department (size 14) at Neiman Marcus that was inexpensive and well constructed, and with pants it looks a bit like a interesting tunic. I agree with Kate about the masculine/feminine mash-up on your outfit. Gorgeous. And pockets! I knew you were brilliant, but now you’re blowing my mind. Did you pretend the dress was for “a niece” or did you tell all to the saleswoman? YOOX has the MOST BEAUTIFUL selection of girls’ clothing . 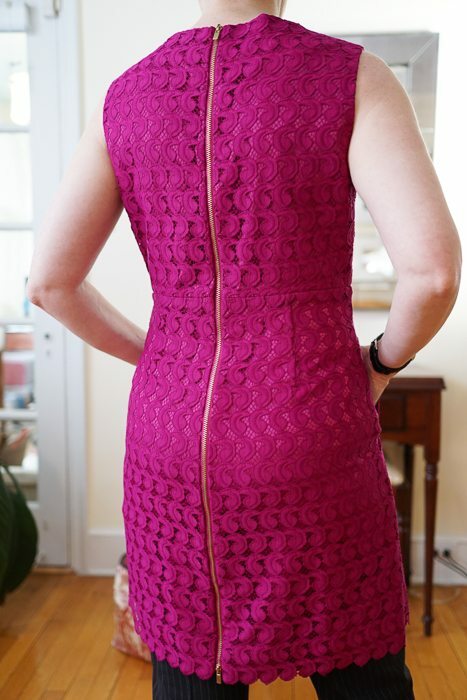 . .
Love the pop of color and the zippered back! Like other contributors I’m not a fan of ‘dress over pants’. The bulk of pants under a slim styled dress does not work for most people. I do very much like the proportions of the sweater and the dress length and without the slacks I see a lovely dinner/meeting ensemble! Gasp, the dress! It’s beautiful. I’m a big fan of the dress/trousers combo and, unsurprisingly, this is one of my fav outfits of yours. This is a v common look in London. I like the look on slender folks but not on me. It makes me look fat! No, I’m not fat at all but a victim of society’s expectations, ha. I do wear black or brown tights with matching shoes/boots when dresses are shorter. I don’t mind a dress hitting above the knee as long as I can sit at a table and enter/exit a car comfortably. The dress over pants silhouette doesn’t work for me. The last thing my waistline needs under a slim dress is another layer. My suspicion is that this kind of style comes from the high-end fashion houses because it sells in countries where women dress to impress as well as to cover up. I imagine the dress would be worn with a long-sleeved top underneath, as well as the pants. I’m in the feed of a blogger from Kuwait who is clearly selling to the Arab world, and she’s prone to this kind of layered thing. Dear Directrice, I really enjoy your blog and have been visiting every week since discovering your article “The Small but Smart Wardrobe”. However, I must dissent on this occasion. Black opaque tights with brogues or boots would look so much better. Very Meg Ryan in “You’ve Got Mail” or Lucy Liu in “Elementary”. Opaque tights would provide the requisite coverage and warmth for legs, knees and feet. Brogues or boots would bring a nice masculine edge while still allowing the dress to be the star. The dress isn’t a tunic or smock or pinafore. It’s a dress. Let it fulfil its destiny as a dress instead of trying to make it into something it isn’t! Even black ankle-length leggings in warmer weather with brogues or black ballet flats would be better than pants. I like the idea of pants-under-dress because it’s a more tailored look than tights or leggings, but I wonder what narrower pants would look like. Also like the idea of pants for the more tunic-like “dresses” I see (e.g. Boden) because in work setting I think those are way too short, even with tights or leggings. Will explore and get back to you. I will say, however, that you inspired me to wear black sweater & boots with bright pink skirt this week, to match the brief hint of spring here in Minnesota. I’m trying to understand how this look can be controversial…dress over trousers is nothing out of the ordinary in Europe. At all. All ages all sizes wear this combo…are Americans a bit more, uh, conservative?